It's the season again, finally, for buying vegetables from the people who grow them. 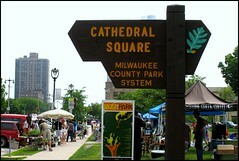 The East Town Market, in Cathedral Square park smack dab in the middle of downtown Milwaukee, is my favorite local Saturday a.m. destination in fair weather. It boasts not only stalls offering produce and other good things, but also live jazz and a playground for the amusement of youngsters. It's still way too early for any of the crops that really excite a cook. We can still dream of sugarsnaps, asparagus, corn, tomatoes, squash, melons, berries, even cauliflower and carrots and turnips. 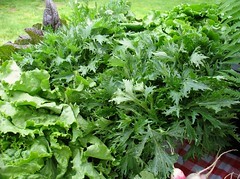 But in early June the best we're going to get is radishes, onions, and greens. That's good enough for now, though, after a long winter of nothing but storage crops and imports from Cali and Latin America. 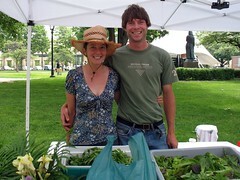 These folks from Willoway Farm (their sign says "est. 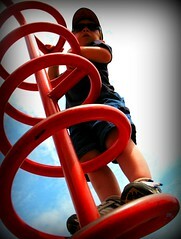 2007"--is that not awesome?) were offering juicy, spicy radishes, and several varieties of greens. One was this mizuna, which looks prickly, and which I photographed but didn't take home. We did have their mesclun, which included some rather sassy arugula. 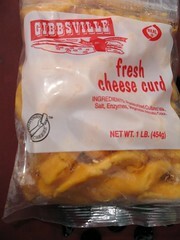 And there are always fresh cheese curds at a farmers market in Wisconsin. They're worth the trip all by themselves, and are best if you can wait to eat them until the chill is gone, which no one can do. Then they really squeak between your teeth as they yield their salty, fresh, cheesy flavor. It is, as ever, my pleasure to live in the dairy state.